We made automata several different ways in the past and eventually settled on this one, which we call diving board automata. The main structure consists of some sort of container with a piece of foam core sticking off the top like a diving board. The container can be a cup, yogurt container, soda bottle or any other shortish food containers which serves to hold the crank shaft. The diving board holds the mechanism and the scene to be animated. This is a distinct advantage over micro automata because the mechanism is easily accessible if it needs repair or adjustment. First poke 2 holes in the bottle about 2/3 of the way up. Wood screws work well for this as you can use them to drill into the plastic Optimally, the holes should be straight across from each other and just big enough to fit a skewer so it can spin freely. Next make the diving board, an about 3''x5'' piece of foam core. This will be the platform on which the object to be animated will be built. 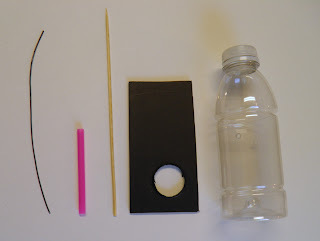 In order to cut the hole in the board take the lid off the bottle and press the mouth of the bottle into the center of one end of the foam core. 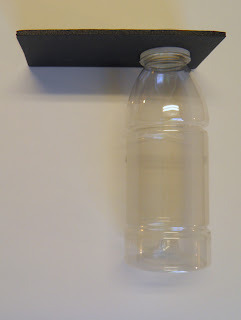 Use a utility knife to cut out the imprint and then use a screwdriver or pen to stretch out the hole until the board will just fit the top of the bottle. 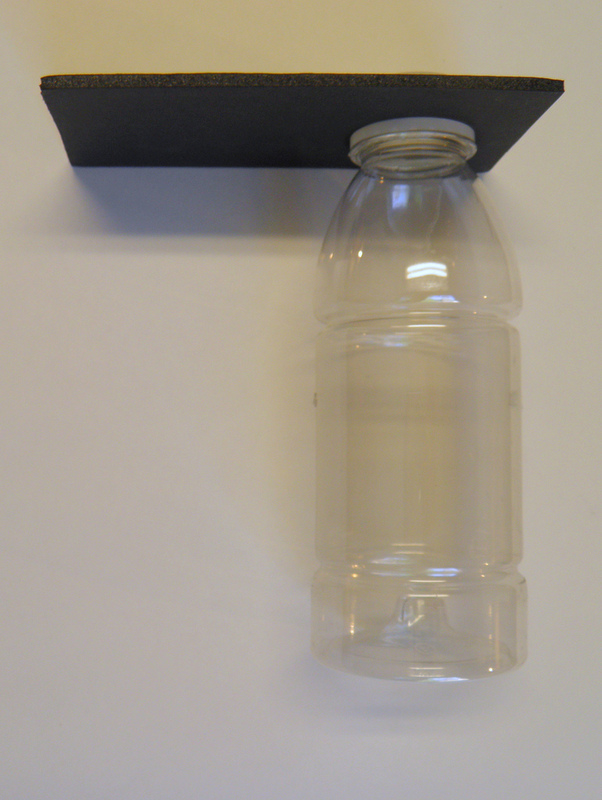 Position the foam core over the 2 holes in the bottle and tighten down the cap to hold it in place. 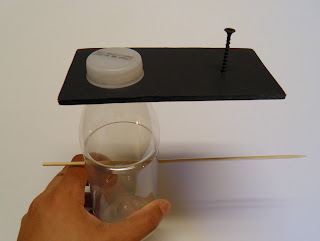 If you want to use a cup simply glue the diving board to the top of the cup for this step, this will make a simpler, but somewhat less stable automata. 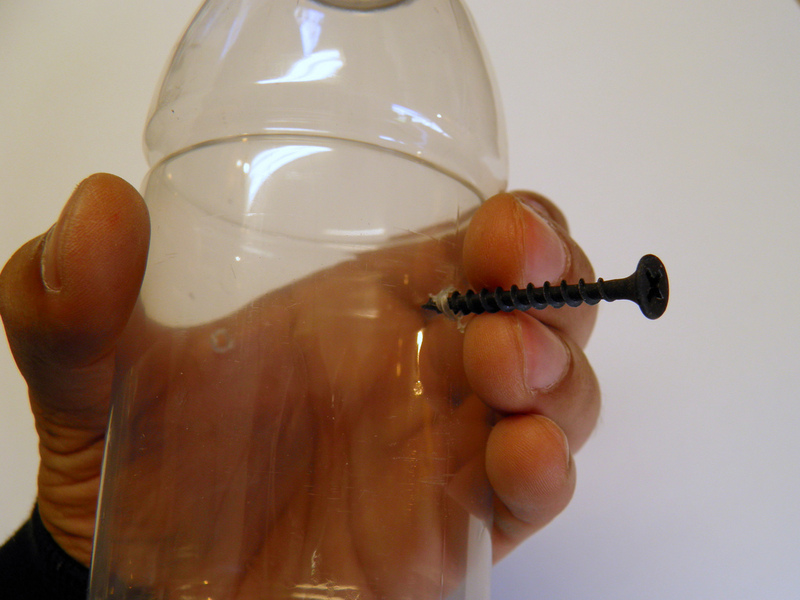 Use a screw to poke a hole in the end of the board. This hole will hold a straw and skewer for the cam and friction gear automata or a wire for a crank slider mechanism. We've made a simple crank wheel by hot glueing a bottle to the end of a skewer and then adding another small section skewer to the side of the cap to form the crank. Here's the automata with the crank inserted and a handle and straw spaces added to keep everything in line. 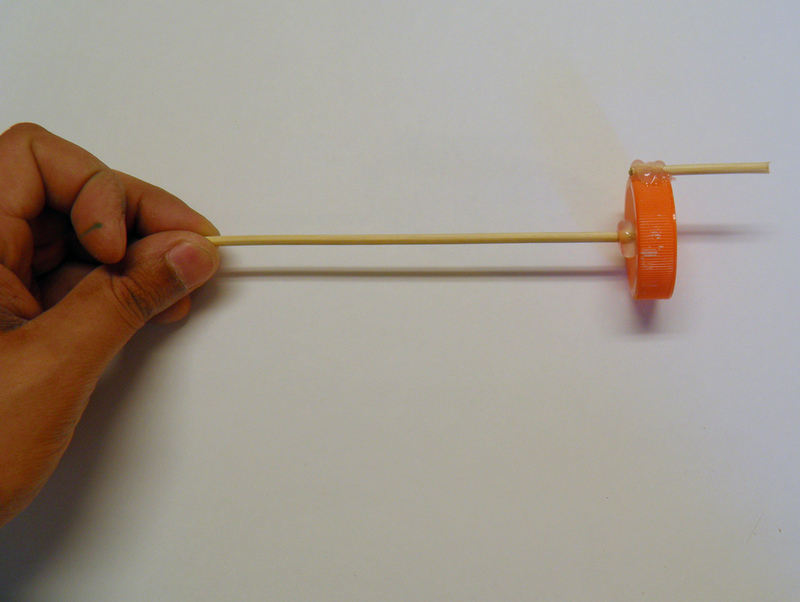 Here's the completed crank slider mechanism with a long piece of annealed steel wire attached to the crank and a piece of foam core added to prevent the wire from slipping off. Adding a small piece of straw or another piece of foam core between the crank wheel and the wire is a good way to keep the wire from slipping back and fourth. Alternately, you could add a cam instead of a crank slider for a straight up and down motion. 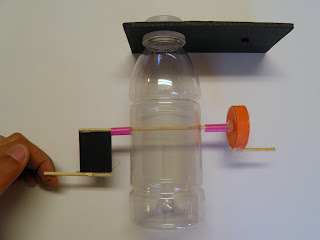 If you used a simple wheel instead of an eccentric cam you can make a friction gear in order to get a spinning motion. Here's the cam with the follower wheel installed and lever arm to modify the up and down motion (there's a video of this below). Note that the addition of an arm did make the arching motion the builder wanted but is not a necessary part of the cam mechanism. Note that we added some sand to the bottle to help keep it steady. 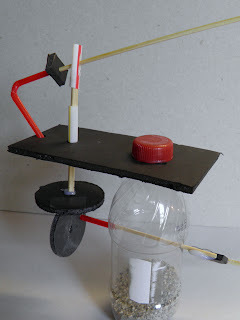 If you make a cup based automata you will be unable to add sand for stability but you can simply glue the whole thing onto another piece of foam core or cardboard to make a foot. 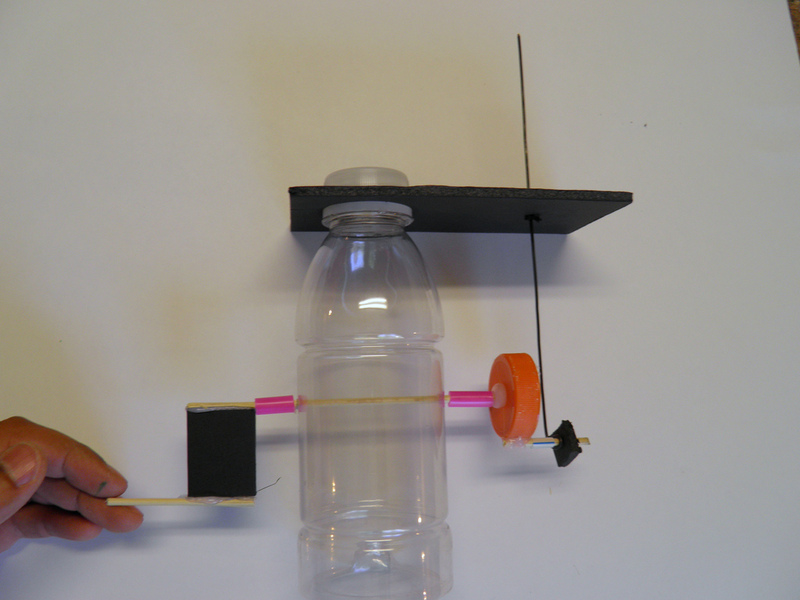 This bottle based automata uses the cam mechanism shown above for an up and down motion. Here's the same automata as seen from the back, a screwer and several straws have been used to get an arching motion from the original straight up and down motion. This bottle based model uses the more complicated crank slider mechanism, using thin wire to constrain the wings to the diving board to get the flapping motion. Here's a cup based crank slider mechanism this time with the top of the head constrained to the diving board to make the mouth open and close. 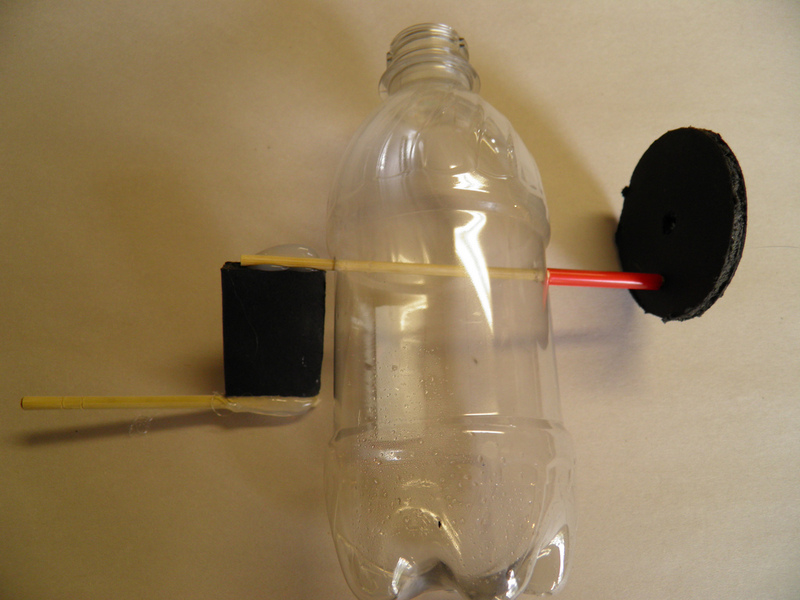 Here's a side view of that same mechanism.